Michael Coyne is Professor of Educational Psychology and the Coordinator of the Special Education Program at the University of Connecticut. He is also Co-Director of the Center for Behavioral Education and Research. He has expertise in beginning reading and early vocabulary instruction and intervention, school-based experimental research, multi-tiered or RTI systems of support, and effective practices for students with learning disabilities. Dr. Coyne has directed or co-directed five multi-year research projects funded by the U.S. Department of Education’s Institute of Education Sciences focused on optimizing vocabulary and beginning reading practices for students with diverse learning needs through school-based experimental research. 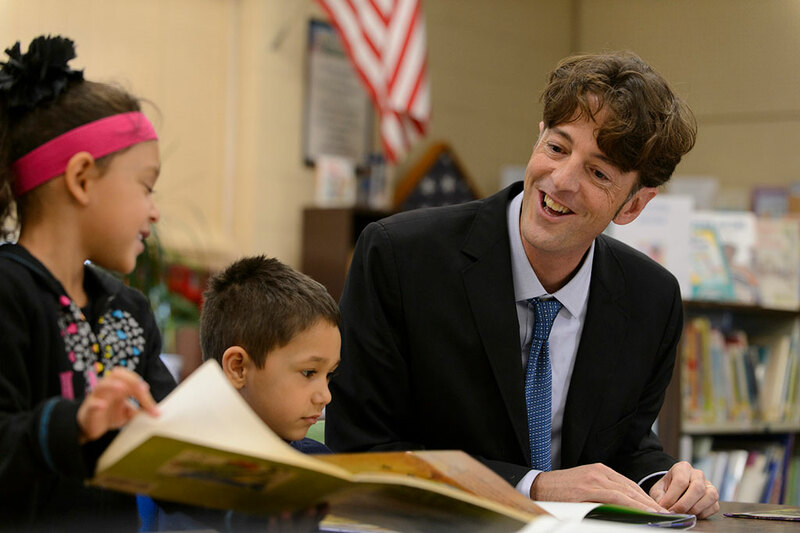 Dr. Coyne provides assistance and consultation to school districts and state departments of education around the country related to reading and literacy initiatives. He regularly presents at national conferences on research related to effective instructional practices, school improvement, and beginning reading and vocabulary instruction and intervention. Dr. Coyne holds certification in both elementary and special education and is a former special educator in public schools. Simmons, D., Coyne, M. D., Fogarty, M., & Kwok, O. (2014-2017). Teaching the Vocabulary of Comprehension: A Technology-Enhanced System to Enhance At-Risk 3rd Graders’ Acquisition and Application of Essential Vocabulary. U. S. Department of Education, Institute of Education Sciences, Reading & Writing (Goal 2 – Development). $1,495,000. Kearns, D., & Coyne, M. D., (2016-2019). Intensive Interventions Modules Development. Contract with the National Center for Intensive Interventions, American Institutes for Research. $598,828. Coyne, M. D., Simonsen, B, & Lombardi, A. (2017-2022). Project NeXus II: Doctoral Leadership Training in Literacy, Positive Behavior Supports, and Postsecondary Transition. U. S. Department of Education, Office of Special Education Programs. $1,250,000. Coyne, M. D., Kearns, D., Olinghouse, N., Simonsen, B., Freeman, J. (2015-2020). National Center for Leadership in Intensive Interventions. U. S. Department of Education, Office of Special Education Programs. (subcontract with Vanderbilt University). $768,712. Coyne, M. D., Kame’enui, E. J., & Carnine, D. W. (2011). Effective teaching strategies that accommodate diverse learners. (4th Ed.). Columbus, OH: Merrill Publishing Company. Coyne, M. D., & Koriakin, T. A. (2017). What do beginning special educators need to know about implementing intensive reading interventions for students with disabilities? Teaching Exceptional Children, 49, 239-248. Coyne, M. D., Oldham, A., Leonard, K., Burns, D., & Gage, N. (2016). Delving into the details: Implementing multitiered K–3 reading supports in high-priority schools. New Directions for Child and Adolescent Development, 154, 67–85. Coyne, M. D., Cook, B. G., & Therrien, W. J., (2016). Recommendations for replication research in special education: A framework of systematic, conceptual replications. Remedial & Special Education, 37, 244-253. Loftus-Rattan, S. M., Mitchell, A. M., & Coyne, M. D., (2016). Direct vocabulary instruction in preschool: A comparison of extended instruction, embedded instruction, and incidental exposure. Elementary School Journal, 116(3), 391-41. Cuticelli, M., Collier-Meek, M., & Coyne, M. D., (2016). Increasing the quality of tier 1 reading instruction: Using performance feedback to increase opportunities to respond during implementation of a core reading program. Psychology in the Schools, 53(1), 89-105. Crevecoeur, Y., Coyne, M. D., & McCoach, D. B. (2014). English-language Learners and English-only Learners’ Response to Direct Vocabulary Instruction. Reading & Writing Quarterly, 30, 51-78. Coyne, M. D., Simmons, D. C., Simmons L., E., Hagan-Burke, S., Kwok, O., Kim, M, Fogarty, M., Oslund, E., Taylor, A., Capozzoli-Oldham, A., Ware, S., Little, M. E., & Rawlinson, D. M., (2013) Adjusting beginning reading intervention based on student performance: An experimental evaluation. Exceptional Children, 80, 25-44. Coyne, M. D., Little, M. E., Rawlinson, D. M., Simmons, D. C., Kwok, O., Kim, M, Simmons L., E., Hagan-Burke, S., & Civetelli, C. (2013). Replicating the impact of a supplemental beginning reading intervention: The role of instructional context. Journal of Research on Educational Effectiveness, 6, 1-23. Hagan-Burke, S., Coyne, M. D., Kwok, O., Simmons, D. C., Kim, M., Simmons, L. E., Skidmore, S. T., Hernandez, C. L., & Ruby, M. M. (2013). Effects and interactions of student, teacher, and setting variables on reading outcomes for kindergarteners receiving supplemental reading instruction. Journal of Learning Disabilities, 46, 260-277. Simmons, D. C., Coyne, M. D., Hagan-Burke, S., Kwok, O., Simmons, L., Johnson, Zou, M., Taylor, A., McAlenney, A., Ruby, M., & Crevecoeur, Y. (2011). Effects of supplemental reading interventions in authentic contexts: A comparison of kindergarteners’ response. Exceptional Children, 77, 207-228. Coyne, M. D., McCoach, D. B., Loftus, S., Zipoli, R., Ruby, M., Crevecoeur, Y. & Kapp, S. (2010). Direct & Extended Vocabulary Instruction in Kindergarten: Investigating Transfer Effects. Journal of Research on Educational Effectiveness, 3, 93-120. Coyne, M. D., McCoach, D. B., Loftus, S., Zipoli, R., & Kapp, S. (2009). Direct vocabulary instruction in kindergarten: Teaching for breadth vs. depth. Elementary School Journal 110, 1-18.